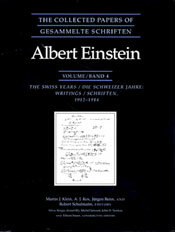 Volume 4 presents Einstein's writings from the final period of his work in Switzerland. Most of the material documents Einstein's search for a relativistic theory of gravitation, a search that ended in Berlin in the fall of 1915 with the completion of the general theory of relativity. Three scientific manuscripts, printed here for the first time, provide insights into Einstein's efforts to generalize his original relativity theory into a theory of gravitation. The first provides a survey of the special theory of relativity. The second consists of notes that document Einstein's research on gravitation. The third contains calculations on the problem of the motion of the perihelion of Mercury. The explanation of the observed anomaly of this motion was to become one of the classical tests of general relativity. The existence of such a manuscript was not known until now. All three of these manuscripts add significantly to our understanding of the creation of general relativity.